As moms, business owners, and HUMANS in the 21st century – there’s a whole lot to keep mental track of in this lifetime. At any given moment we’re holding mental space for all KINDS of tasks and to-dos… scheduling dentist appointments, emails, laundry, meals, projects, client work, personal finances… it’s a lot. Thing is – when we let #allthetasks build up, keeping squillions of mental tabs open at a given time, we drain our precious energy. Every now and then we need to clear the mental decks and take our energy back. In this episode I share my fave process for doing just that — the power of (what I call) a brain sneeze – how you can use pen + paper to take a HUGE load off your shoulders in 15 minutes or less. I also cover a simple DECISION framework to help you create a clear action plan for each and every thing on your list. 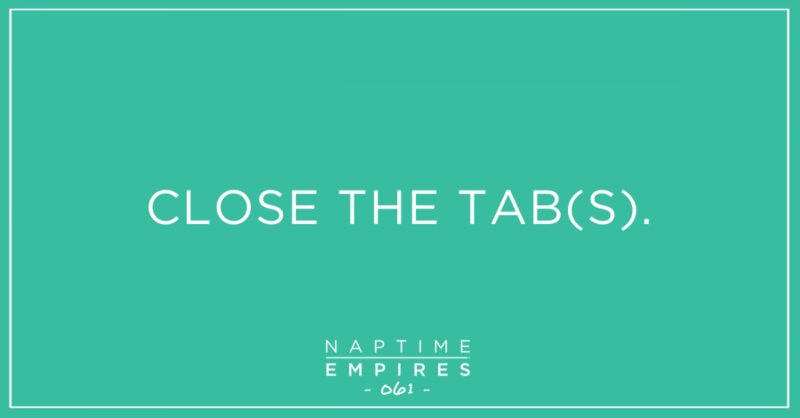 Whether you delete, delay, delegate, or DO the dang thing, my guess is you will feel a WHOLE lot better after you close some tabs today. Take a listen, give it a go, and as always – let me know your fave takeaway by taking a screenshot (or a selfie as you listen) + tagging me on Instagram @nikkielledgebrown with #naptimeempires.